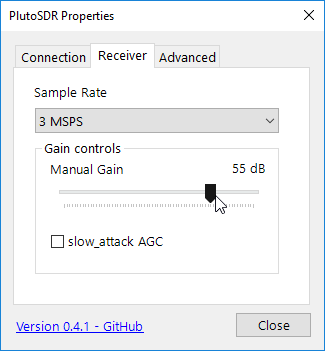 This guide is intended to get you set up with your PlutoSDR quickly and easily on either Linux or Windows. We also show how to apply a simple software 'hack' to your PlutoSDR to extend its frequency range to about 70 MHz to 6000 MHz and bandwidth to 56 MHz. Note that the Windows SDR# plugin requires this hack to be performed first, which is why we put this hack at the top. 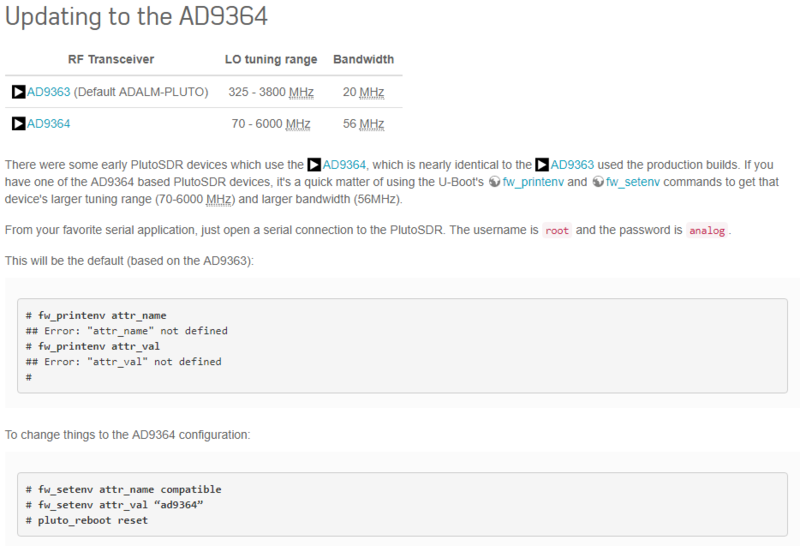 This hack tricks the PlutoSDR firmware into thinking is has the AD9364 chip. As the AD9363 and AD9364 chips are very similar this works. Note that you do this at your own risk, but we feel that the risk is very low. If you don't have it already, download the terminal emulator software PuTTY from putty.org. Plug in your PlutoSDR on the USB port. Open Windows Device Manager, and expand the Ports (COM & LPT) entry. Take a note of what COM port the PlutoSDR Serial Console is using. In the screenshot ours is using COM6. Close device manager after. Open PuTTY and select the 'serial' button. Under 'Serial line' type in the COM port the PlutoSDR is using. In our case we type COM6. Press Open and you should be greeted with a login screen. Login with the credentials username: root, password: analog. Now follow the instructions in the following screenshot image, typing in the three commands as they appear. 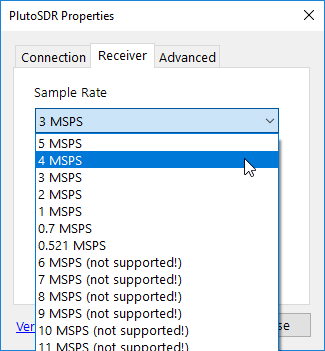 After doing a reset your PlutoSDR should now be upgraded to the full frequency range and bandwidth. Download the Windows Drivers from here. 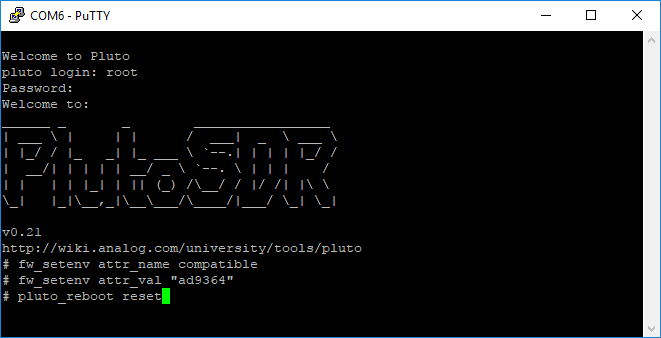 Choose the latest version of the PlutoSDR-M2k-USB-Drivers.exe download. Run the installer and complete the installation by clicking through the prompts. Plug in your PlutoSDR. 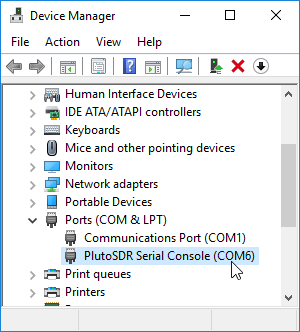 Windows should automatically recognize the PlutoSDR and a folder containing the PlutoSDR config file may pop up. 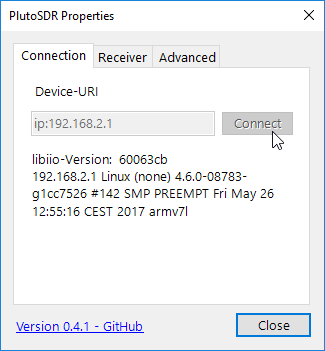 PlutoSDR creates a USB disk drive, USB network connection and a USB serial port. You can confirm in Windows Device Manager if these interfaces have been added. Download and extract SDR# into a folder of your choice from airspy.com/download. Make sure that you download the x86 version, do NOT download the x64 version. 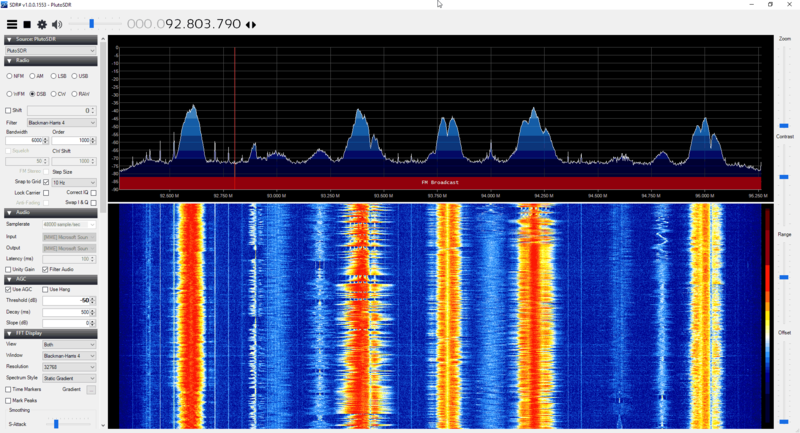 Grab the current release of the SDR# PlutoSDR plugin from here. Download the sdrsharp-plutosdr-x.x.x.zip file. 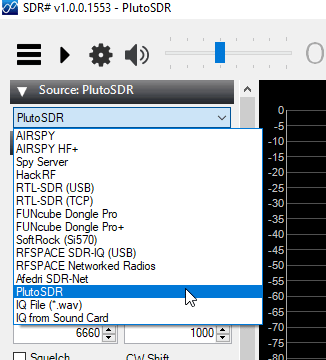 Extract the contents of the PlutoSDR SDR# plugin zip file into your SDR# folder. In the SDR# folder find the "FrontEnds.xml" file. Right click it and go to "Open With" open it with Notepad, or any other text editor of your choosing. Before the </frontendPlugins> closing tag, add the PlutoSDR key below, and then save and close Notepad. NOTE: If you are copy and pasting, please double check that your browser is not converting the double quotes (") into backquotes. Open SDR# and under the Source pull down box choose PlutoSDR. Open the properties box by clicking on the cog icon which is next to the play button. In the default Connection tab ensure the Device-URI is "ip:192.168.2.1", and then click on "Connect". Press close the configuration box, and then press the Play button in SDR#. The PlutoSDR should now be running. Open the configuration box again to adjust the gain.